See the risks of obesity and pregnancy. Get expert advice on how much weight gain is expected in pregnancy, when is one considered obese and pregnant, and how to deal with weight issues before and during pregnancy. Are you overweight and pregnant? Or are you looking for information on the effects of obesity on fertility if you are trying for a baby? Well, medical research has demonstrated that you are less likely to conceive if you are obese. But the problem goes beyond that. If you are pregnant and obese, you and your unborn baby are likely to experience more complications during pregnancy, in labor and there after. Does that mean that it is wrong to add on weight in pregnancy? No. Not if you add on a modest amount of weight. How much is modest weight in pregnancy? Every pregnant woman is expected to put on an average of 6 to 15kg (up to 31 lb) of weight as the pregnancy progresses. This is as a result of increased blood volume needed for a healthy pregnancy, the additional weight of the baby, the placenta, increased breast size, and the increased size of the womb. This additional weight gain tends to resolve in the following 6 to 12 weeks after delivery. So, when is one said to be obese in pregnancy? To be overweight is defined as having a BMI between 25 kg/m2 and 29.9 kg/m2, and to be obese is to have a BMI of 30 kg/m2 or more. Obesity in pregnancy, or obesity and pregnancy (also called maternal obesity or gestational obesity) refers to the excessive weight gain occurring before or during pregnancy, in an expectant mother. 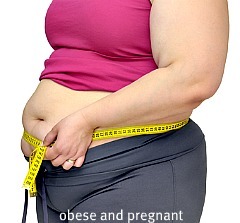 Anything in excess of the above weight gain of 10 to 15kg (some may stretch this up to 20kg) occurring during pregnancy is unhealthy and constitutes gestational obesity or obesity in pregnancy for an hitherto normal-weight woman, and no more than 15 to 25 lb (6 to 12Kg) additional weight for an already over weight or obese mother-to-be. For clarity, a BMI of more than 35 puts a pregnant woman at moderate risk of complications associated with pregnancy and delivery, and certainly, a BMI of 40 or more confers a very high obstetric risk on the mother-to-be. So too is a preexisting obesity before pregnancy. It dramatically increases the risk associated with pregnancy. A review published by the United Kingdom Centre for Maternal and Child Enquiries in the bi-yearly publication Saving Mother's Lives (previously known as Confidential Enquiry into Maternal and Child Health) reports that there is "substantial evidence that obesity in pregnancy contributes to increased morbidity and mortality for both mother and baby". It continues "more than half of all women who died from direct or indirect causes were overweight or obese". What a grim report. No wonder obesity and pregnancy should be given more than the usual attention. Death of mother from blood clot or related complications during pregnancy or within the following 42 days after delivery. In the United States alone, obesity accounts for over 300,000 deaths annually, and a large number of these include mothers-to-be. Yes. It is no longer fashionable to pile on the pounds during pregnancy. No more "eating for two" in terms of the size of portions served when you are pregnant, but certainly true in terms of quality of food to eat when pregnant. While dieting is not recommended during pregnancy, if you find out that you are obese, there is a lot you can do to remedy the situation before you become pregnant and even while you are pregnant. If you are obese and finding it difficult to get pregnant, losing 5 - 10 percent of your current body weight can significantly increase your chances of getting pregnant. Have you been trying to lose weight and continue to find it difficult to do? Do not despair. It is not going to be easy, but it is do-able. If you think it is impossible, then think again. Mexican Manuel Uribe was the world's fattest man until February 2012. He lost 60 stone to hit 31 stone after dieting! Start an Exercise program. Start by doing a little more than you would usually do, like stopping a bus stop earlier than you would normally stop and walk the extra distance. Use the stairs instead of lift at every opportunity. Go for a 20 or 30 minutes walk every evening if possible. What about running? Joining a dance club? Once your motivation level increases, and you sure you do not want to risk the problems associated with obesity and pregnancy, you can get your own in-house "gym" and stock it with any of these exercise equipment for the obese. Remember that you can see your doctor to prescribe you a supply of weight loss pills to help lose weight like Orlistat (also called Alli in some countries). Doing all the above in conjunction with your health care provider could help in bringing down your weight and in improving your chances of getting pregnant. If your weight problem is caused by the condition known as polycystic ovarian syndrome (PCOS), your doctor may decide to put you on metformin and or clomiphen to help in improving your fertility and weight loss. What if you are pregnant and want to lose weight? Aggressive weight loss during pregnancy is not advised. Neither is the use of weight loss medication. If you are already pregnant and want to lose weight, a regime of sensible dieting and moderate exercise is best. Be sure to verify from your health care provider that your health will allow you to do any exercise before embarking on such. You can read more on workouts in pregnancy here. If you or your loved one require further help with dealing with obesity in pregnancy, see your GP or Family doctor who can give you detailed practical help. Obesity and Pregnancy: Have Your Say! Do you have a comment or great idea on how you dealt with obesity in Pregnancy? Or just a question on this topic you want an answer to? Share it. Post it here!